Q: We hear the Town has passed a new ordinance pertaining to fireplaces. Can you give us some details and how this might/will affect real estate sales, transactions and values? A: The new ordinance was signed into place last month (March 20). It will be referred to as “13-03” and it passed rather quietly. But there was significant public notice/information and media coverage prior to the hearings and passage. Nobody can say they didn’t know it was coming (except maybe second homeowners). 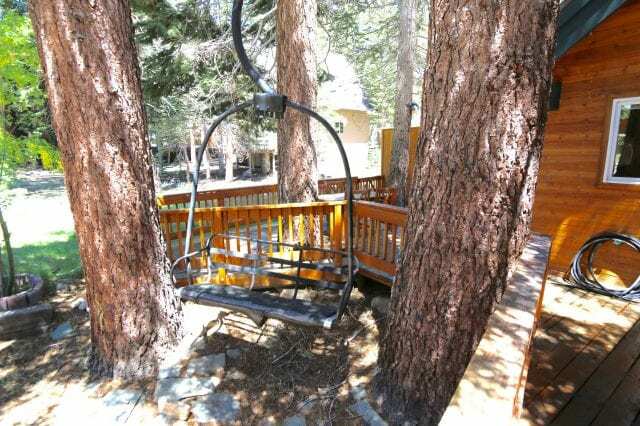 This fireplace related ordinance is primarily a Health and Safety issue resulting from a string of structural fires in older properties located in Mammoth Lakes. It is hard to argue with the fire department, and they drove the new ordinance. The “trigger” for the burdensome modifications will be the sale (transfer of ownership) of an applicable property, or the fall of 2022 whichever occurs first. Properties that are in escrow prior to June 30, 2013 will be exempt from the immediate “sale” trigger. So this may create a small push of sales prior to that date. But so far it doesn’t seem to be weighing heavily on the minds of either buyers or sellers. The 13-03 ordinance focuses on woodstove inserts and not freestanding woodstoves. But there is a small amendment in the ordinance that states “It is unlawful for anyone to install and use a woodstove, woodstove insert, or similar appliance without first obtaining a building permit.” This is interesting because I can tell you that there are still hundreds of wood burning appliances in Mammoth that have never been permitted. Anything installed prior to 1990 probably does not have a permit unless someone went through the drill to have it inspected and permitted. And that is not very likely. Regardless, the impact of this ordinance is on fireplaces with wood burning inserts. The Health and Safety issue that has become evident with these inserts is the potential slow burning occurring behind and above the heavy metal fire boxes (and where the average homeowner can’t see what is going on). That slow burning of combustibles behind the fire box, or “pyrolysis” as the professionals like to call it, can ultimately lead to major structural fires. One fire at a home in Old Mammoth was lucky not to have casualties. A couple of large condominium projects have already had to deal with it because the insurance companies essentially red-lined the projects after a series of fires. One project did a blanket renovation of all the fireplaces and retained wood burning, the other retrofitted to propane gas burning fireplaces and eliminated wood burning all together. What makes this new ordinance so financially significant is the extent of the renovation and the eventual waterfall of events it triggers; namely more remodeling. I have no doubt this will spur a small remodeling boom. At the same time the majority of the woodstove inserts that have been installed since 1990 are becoming obsolete both aesthetically and functionally. They are and look dirty even though they are “clean burning” appliances. Many owners are pretty tired of them, like having a dirty old antique in the middle of your living room.There are many new and beautiful and very functional products on the market. But more profoundly, now the walls above (to the ceiling line) and around the insert have to come down for thorough inspection of the new installation. That is where the slow burning can occur. So once those walls come down there are a myriad of new opportunities in replacing them to make the new fireplace a real showcase and centerpiece of the home. I tell people to budget about $10,000 for this renovation. It can be done for less in most circumstances, but it is the cascading effect of the remodel that really adds to the expense. It might as well be done right. And there are a variety of opportunities. So off comes the old 70’s and 80’s rock and out comes the 90’s insert. The new inserts typically have larger fire boxes and larger glass doors. This allows bigger (or more) logs and more viewing area of the fire. And they are very efficient and effective. Many of the new installations utilize modern rock products on the lower half and some actually downsize the mass of the rock on either side. 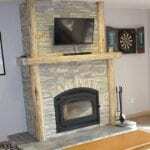 Many owners are now choosing to position large flat panel TVs on the new drywall above the woodstove insert. Or a special piece of art. And certainly there is the opportunity to improve lighting and create some nice shelving for entertainment electronics. And then there are new mantels; either “mountainy” log-style mantels, or sleek “craftsman” style, or even rock or artisan steel. And then a new rock hearth in front. One nice opportunity is to place the actual insert up higher off the floor to make loading wood easier and improving overall room aesthetics. And a hearth you can sit on. The possibilities are endless. Since 1990 the local real estate agents have had to keep an eye to that specific part of any potential purchase agreement. At that time the “EPA” upgrades cost in the neighborhood of $1500 to $2500 to complete. There was real resistance at the time but as buyers and owners became more educated about the “low emission” and “airtight” appliances and how efficient and effective they were, many owners gladly made the upgrade. We often used credits to the buyer (in financed purchases) to help accomplish the installations. But knowing the status of the fireplace was critical in negotiating for either the buyer or the seller. In the first few years we (the Town and the brokers) had to make a few small tweaks to the ordinance to make it more workable for the buyers and contractors/installers. But over the years thousands of retrofits have been completed and the air quality on cold, inverted night has greatly improved. But who “pays” for the installation and retrofit is ultimately another part of the real estate negotiation. The parties simply better be aware of the ordinance and how it affects a particular property. In theory, the ordinance and need for retrofit does diminish the value of the property for the seller. But does it really? The buyers are the ones who will benefit from the improved aesthetics and function and more importantly safety. Most of the properties that require these fireplace inserts are in need serious renovation and remodeling anyway, so the buyers should simply be prepared for it. We’ll see if we revert to buyer credits in financed transactions. The $8-10K credit amount might be too much in some transactions. Quite frankly, the Mammoth real estate industry is just starting to think about it. Then we’ll see how the Town reacts. Even though nightly rentals are “illegal” in single family neighborhoods and that ordinance has been a great source of recent debate, the rental activity continues almost unabated. The understaffed Town government has little ability to oversee any compliance. And in the last few years I have been in numerous Mammoth properties (mostly REOs) that have transferred ownership since 1990 where the existing fireplace or woodstove are not EPA certified. That tells me that the Town hasn’t kept up on 90-04 compliance. So how effective the Town will be at this compliance is yet to be determined. But if the ML Fire Department gets involved with compliance, that will be an entirely different story. Meanwhile, the Town’s building official tells me he is realistic about the mechanics of completing these renovations. Buyers can request initial 60 day waivers to complete the project. The tight (and unrealistic) time frames are one thing we dealt with 23 years ago. There are Mammoth-style decisions, logistics, and contractors to be dealt with, and patience is a virtue. So the program will apparently allow for (new) owners to open a building permit and that will buy them plenty of time to figure it out and get it completed. Condo projects/associations that have this style of fireplace will certainly consider a bulk program. Initially only the owners that “have” to do it will, but I’ll bet that it will catch on (2022 probably isn’t that far off). And more and more beautiful fireplaces will once again become the centerpiece of many older Mammoth homes. 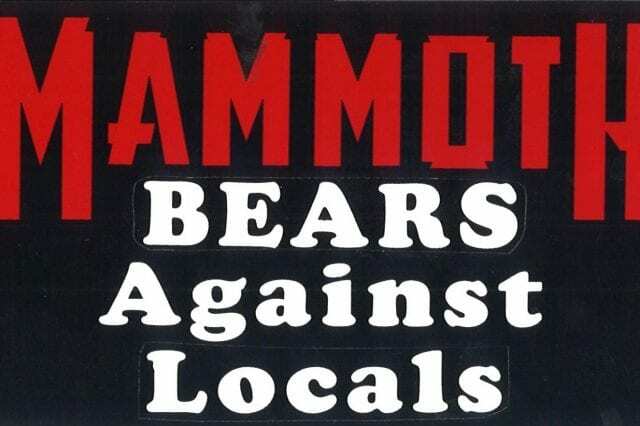 Mammoth Real Estate Q&A: What’s The Best Addition to Mammoth In The Past 20 Years? ?